Matt’s Training Tip #2: Why am I sticking to these tempos? 22 Feb Matt’s Training Tip #2: Why am I sticking to these tempos? 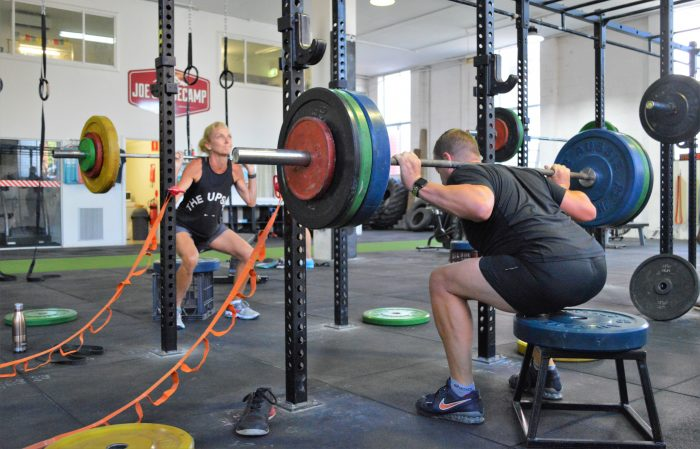 Each week, Joe’s Basecamp strength and conditioning coach Matt Reid gives our members tips for building strength and endurance to help them perform at their best and achieve their bucket list goals. This week, Matt explains why it’s important to follow tempos when performing your exercises. To read Matt’s training tip from last week click here. Last week, we broke down the theory behind training repetition and how we can grow stronger by applying stress to the body to elicit an adaptation. Lifting tempos are another factor that we can manipulate to target a specific adaptation in the body. Tempos are represented by a set of four numbers which describe the number of seconds spent performing the movement. The first number reflects the speed of the lowering phase of the lift, the second the time spent at the bottom of the lowering phase, the third number being the pushing phase and the fourth being the time spent at the end of the pushing phase. For example, if you are performing a barbell squat at a tempo of 6210 you would take 6 seconds to squat down, pause for 2 seconds at the bottom, push upwards for 1 second and spend 0 seconds resting at the top (move straight into the next repetition). A set of 8 squats performed at two significantly different tempos eg. 1010 or 6210, are going to result in two very different outcomes based on the stimulus we have provided. Different speeds can recruit different muscles, even during the same movement; can dictate how long a set lasts for which influences the effect on the body; can influence where strength is gained in the lift; can stress either muscle or tendons more; the list goes on.